So, I had another Pinterest Fail! Did you ever have the experience in middle school where your teacher decided to teach the class about following instructions? The teacher would go on and on about reading all the way through a test, and reading each instruction carefully. Then one day, you’d get a test and the first step was to read through the whole test before answering anything. Those who actually did, were rewarded with the last question being something to the effect of “don’t answer any questions, just draw pictures in all the spaces;” and those who didn’t, got stuck answering all of the questions. Last night, I failed that test. Everyone in my house is sick right now (except me), which means that I’m at the end of my rope and running on fumes. Last night my little girl woke up crying with pain in her ears. Having recently had an ear infection, my heart absolutely broke because I know that pain. 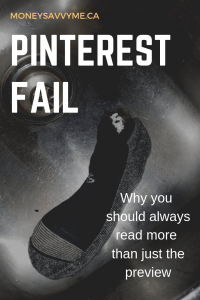 Fortunately, just before she woke up I was cleaning up my Pinterest page and noticed a pin about relieving an ear infection with a sock full of salt. So as my husband tried to console her and alleviate her pain, I quickly googled “salt sock for ear pain” and the article popped right up. 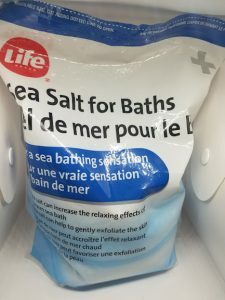 I read the snippet which said to put coarse sea salt in a sock and warm it up. So, I grabbed on of my husband’s old socks, filled it up with some sea salt I had accidentally grabbed instead of Epsom salts one time, then tossed it in the microwave for like 45 seconds. I pulled it out, but it wasn’t quite warm enough yet. So I tossed it back in for another 30 seconds. Still not warm enough. So I shook it up and then tossed it back in for about a minute. When I opened the door, there was a burnt popcorn smell, and though that with a stench that unpleasant, it had better work. Then I pulled out the sock just above the knot I had tied in it… and the top part of the sock completely popped off, spilling salt everywhere. Did I mention that my poor baby was upstairs crying in pain? You know when you’re trying so hard to do things quickly that every second feels like an eternity and something absolutely ridiculous happens? This was one of those times. So I let out a few swear words, tossed the top of the sock in the sink since it was smoldering and went about picking up pieces of salt. Fun. I refilled the sock, bunched the top closed with an elastic and ran upstairs. It wasn’t as warm as I would have liked, but figured it would do the trick. Then I popped into my daughter’s room and saw her sound asleep in her dad’s arms. Fortunately, our other tricks had worked, and she was asleep. But I had a good laugh at myself. After cleaning everything up and taking some pictures, I headed back to my room and sat down on my computer and retold the story in the Treasure Trooper chat I was in. One of the wise members laughed that it probably wouldn’t have happened if I had actually read the article, and I couldn’t help but agree. Naturally, I headed over to the article and actually clicked it and read it. Low and behold, in the first couple of paragraphs was a huge warning that anything other than a WHITE sock would likely catch fire. 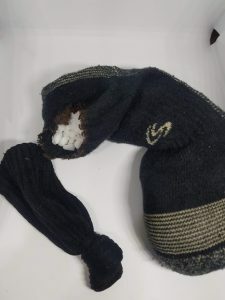 A little later in the article it warned that microwaves aren’t the best way to heat the sock, as they can lead to fires. 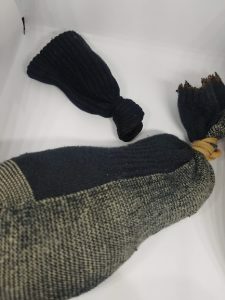 I have no idea if the salt sock trick actually works, but I do now know to actually click and read the entire article before attempting to DIY anything! My full Shoppers Trip 77% Savings!